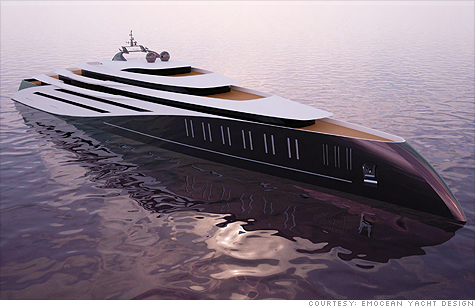 NEW YORK (CNNMoney.com) — The mega yacht business has been slow since the economy soured, but at least one luxury shipbuilder appears to be betting on a rebound. Luxury blog site James List outed Belgium-based Emocean Yacht Design’s plans for an extravagant new mega yacht, tentatively called Project 1000, that — if built — would be the world’s largest vessel of its type. At a whopping 656 feet (nearly the length of two football fields), the ship would be 99 feet longer than the Eclipse, which became the largest private yacht on the water when Russian billionaire Roman Abramovich launched it last year. It would also cost in the range of $500 million to $900 million. In addition to being massive, the futuristic design is replete with features that would impress even the most finicky mega yachtsman, including a 100-foot swimming pool and a health spa. The plans call for a drive-in garage, two 98-foot day boats and a helipad with a hanger, so well-heeled skippers will be able to bring their other toys onboard. The yacht, which would have a range of 6,500 nautical miles, comes standard with plenty of entertainment options to help pass the time on long voyages. There’s a nightclub, a casino and a dual-level cinema for film buffs who want a more authentic movie-going experience. The floating folly would have rooms for 45 guests, including 10 VIP rooms, 22 guest suites and the owners’ deck. It would also have space to accommodate 70 crew members. And with a maximum speed of 28 knots and a cruise speed 20 knots, the ship would be surprisingly fast for its size. However, the project is still very much in the planning phase and with the global economy still struggling it’s not likely to be launched anytime soon. Emocean said it would take at least four years to complete the design and build the yacht if someone ordered it today. The firm acknowledged that the economic climate is not ideal for such an ambitious plan, but added that some mega yacht owners may be looking to upgrade soon as conditions improve. February 21, 2010 in Lifestyle.